With a Coffee Club on every corner and a new café opening every second week it’s easy to miss some of the great cafes hidden down laneways, up staircases and in the suburbs. Until we find a way to directly IV coffee into our veins behind our desks we’re going to continue visiting cafes, so lucky for you, we’ve sourced some of the hidden ones from around Brisbane. It’d be criminal to make a “Best Hidden Cafes” list and not include Bunker Coffee. 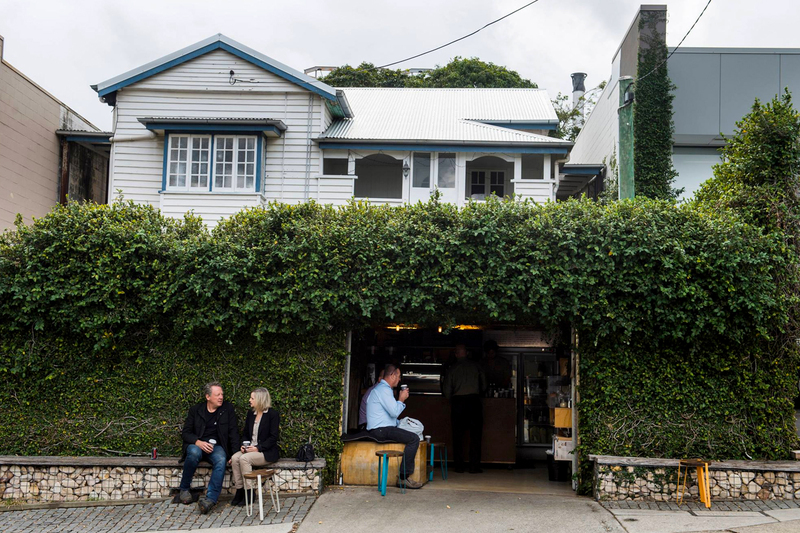 This literal hole in the wall serves up the finest brews in Brisbane along with delectable treats, so you can sip your espresso while surrounded by leafy vines and friendly staff. Dubbed as one of the best cafes in Brisbane, we’re holding down the fort in Bunker. Some people like to take the high road, but not these misfits. As famous for their political slogans as they are for their food, The Low Road is the café you never knew you needed – but now you can’t live without. Hidden away near Windsor Station with its eclectic décor, fun staff and bangin’ coffee – this is one road we don’t mind taking again and again. Whether you’re soothing your hangover with a brekky beer and some beans or grabbing a takeaway on your way to the station – make your next road The Low Road. Tucked away from the main drag on Browning Street is West End’s favourite gal – Betty. With pink walls, leopard print counters and Brad Pitt posters, Betty’s is the 80s teenage dream bedroom you always wanted. The renovated Queenslander serves fresh baked goods daily, damn fine coffee, killer milkshakes and a whole lot of attitude. More about lager than lattes? Betty’s ya gal, turning into a bar at night (or day – we don’t judge) with Young Henry’s on tap and some of the best cocktails in town. Upstairs, secreted away on Burnett Lane the hideaway wholefoods spot makes everything on their seasonal menu from scratch, including spiced baked beans with greens and labneh and abundant salad options. Sit back with an organic autumn brewed chai or a green smoothie and watch the world go by. By night sip on biodynamic and organic wines and enjoy a mezze plate with sweet potato falafel, labne, olives and pickles. The little engine that could, Espresso Engine is your one-stop-shop for a speedy inner-city lunch. With three locations, tasty toasties, sandwiches and daily salad specials Espresso Engine can’t be beaten for its speedy service and expertly made coffee. Better still, their Charlotte Street store transforms into a bar on Friday nights – Espresso Martini anyone? You’ll forget you’re in the middle of the city when you step into Brew. Located down an alleyway, hidden by an old brick loading dock, the café offers specialty cocktails and expertly brewed coffee to weary city folk. The daytime menu offers bagels, breakfast bowls and burgers, as well as an evening menu of tapas dishes and share boards. Comfy couches are waiting for you to sink into as you sip on their range of beers and ciders and admire the art covering the space. So next time you’re contemplating your second chain bought vanilla latte, slap yourself, because a) that’s disgusting, and b) there are so many better options out there – you’ve just got to find them. Put it on the gram! Brisbane's most Instagrammable cafes.